What is Roosevelt Grooming and what do you sell? 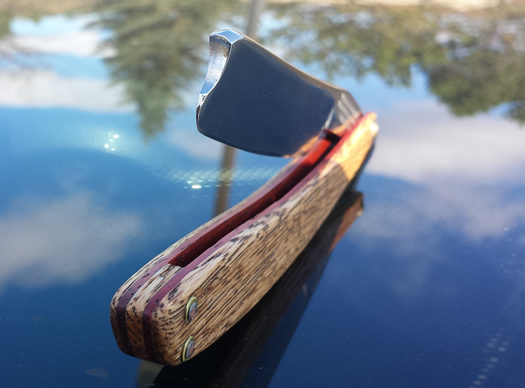 It's a grooming products company centered on restored vintage straight razors. It all started when I was given a straight razor as a gift. I really wanted to get into straight razor shaving, and I didn't know that much about it, but I knew vintage ones were the better ones. 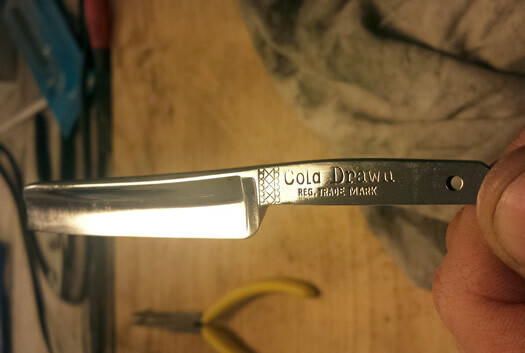 A friend of mine gave me a vintage straight razor with a broken handle, not knowing it was broken. It went from a short second of disappointment to the best thing ever. I've been doing woodworking forever. So I was looking at this razor with a broken handle and I thought 'I can build a handle.' So I did that -- I carved it out and built it. And from that point on, I was hooked. 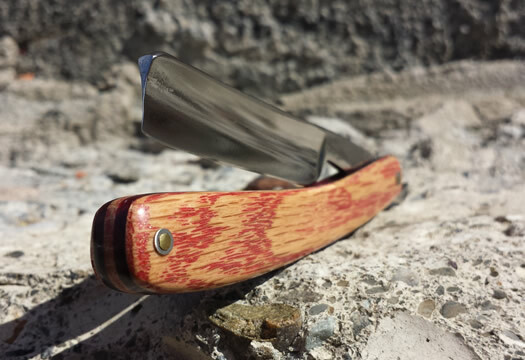 Not only with straight razor shaving, because it's the best way to shave, but also with building handles. I started buying vintage straight razors. And I would use them with the scales that they come with -- the handle is called the scale -- and they're these cheap plastic things. They're usually like 100, 150 years old, depending on what type of blade it is. And they're never balanced quite right. But the idea of making them to sell came from me being full of myself and showing them off. And people would be like 'you should sell those things.' That's where it all started. Are you making all of the items from scratch? Yes. I have aftershave, pre-shave oils, soaps, shaving brushes and bowls. I'm working on a lotion recipe, but I haven't gotten it down yet. And this is all in your off-hours, because you have a day job? Yeah, it's all me. Just me. I partner with a lot of people. When I started this, I had a big barn -- I lived in Fairbush Feura Bush. And then I moved to Cohoes and now I'm in a one-bedroom apartment, and it is also my workshop. I got a membership to the [Tech Valley] Center of Gravity, so I use their workshop. I buy these vintage blades, and there are a lot of them out there. I get them from estate sales, flea markets, or eBay. It's safe to say that they're never shave-ready. They're sharp, but the difference between something being knife-sharp and something being shave-ready is huge. At the beginning I was trying to sharpen them myself, but that's a whole skill in it of itself. I went through a whole bunch of knife sharpeners -- when it's straight razors, they're called honemeisers. I finally found a guy in Nassau, Ryan Davis, who went to Hudson Valley for metal engineering. 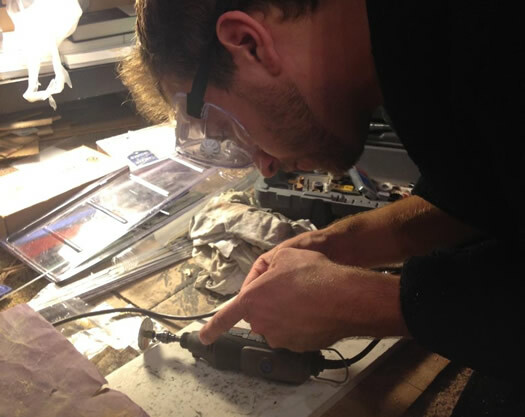 They guy knows metal -- he looks at it under a microscope -- it's insane. Where can you buy your razors, besides your Etsy Shop, Roosevelt Grooming? Enigma.Co, Fort Orange General Store. And I did the pop-up shops in Albany, and I'm doing the Foundry's Made By Hand Invitational this December. I'm really limited since I'm doing it myself. I have to be really picky about who sells the razors because I just don't have the inventory. Is that because of time or demand? It's both. It takes about 8 hours to do each razor by hand. You know, I only have so much time. I only want to sell at places that are a good fit. Every single razor I sell, I get the information about it. So, this is a Wade & Butcher. All the vintage straight razors have a stamp. That's the thing I like best about these vintage blades. The company went out of business in 1890, so the latest possible date for this thing is 1890, but it's probably the mid 1800s because of the shape. It feels so good to take something like this and to be able to clean it up, knowing it's 100 years old and give it new life. It also feels so good to use a straight razor that you know is ancient. When were straight razors most popular? Well, this design straight razor was first sold in the 1680s, but it didn't really become popular until the mid-1700s. And really, they reached their peak in the early 20th century. 1903 is when Gillette first started selling the safety razors. The guy's a marketing genius, but he's also kind of evil. He did a lot to scare people from straight razors. One of the reasons people are so afraid of straight razors now is because of Gillette's marketing campaigns in the early 20th century. He scared people into thinking that you're going to cut yourself. His strategy was around the idea of why sell something that somebody will use for years, when I can sell something that people will have to keep buying over and over? With straight razors, can you use the same one indefinitely? Exactly, yeah. Every six months or so you need to get it sharpened, but pretty much. So, in your opinion, why use a straight razor? Well, the shave is so much better and so much closer. But the biggest reason for me is because, for most men, it's something you do every day, so it should really be a good experience. It shouldn't just be part of a routine. You're starting your day with history and art. There's a process with it; and it's not a long process. Your shave will go from 5 minutes to 10 minutes. But it's starting your day with beauty instead of routine. Because you're taking care of it, you have a vested interested in the blade itself. It's a valuable thing that you don't just throw away. And you have a connection to your grooming product that you don't have with your disposable cartridges. This interview has been lightly edited and condensed. And the list of stores was updated. Thanks so much for the story! I'm having so much fun with this and it was great to have the opportunity to talk about it with Lauren. For anyone interested, I also do custom orders and you can see more photos on my Facebook page: https://www.facebook.com/RooseveltGroomingCompany. Thanks AOA!!! My grandfathers, and dad probably used them. But, i am curious about when Adam will be getting a clean shave again? I'm proud to say that I shave with a Roosevelt Grooming Company razor. Since I started using one, I've taken to looking forward to shaving for the first time in my life. It's practically an event, whereas before shaving always felt like a drag. 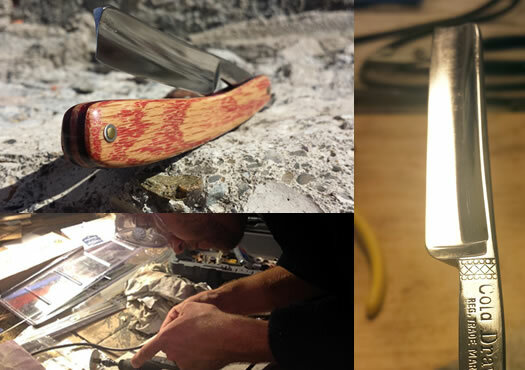 There is zen-like ritual to using and maintaining a straight razor, especially one that has over 100 years of history behind it. I highly recommend it. When I first read this, I thought, "HEY! If the shave is that good, they should make straight razors for women!" But then I thought about how often I nick myself with safety razors, and the image of nicking my femoral artery popped into my head, and bleeding to death in the shower. Don't make straight razors for women. Terrible idea. My father has, for decades, gotten a old-fashioned hot shave with a straight razor weekly from an Italian immigrant named Mario. Lauren, maybe a nice follow-up post would be on places that still offer this serve in the area. "it's starting your day with beauty instead of routine." That. That right there. Perfect. Thanks for this. Really cool. Welcome to Cohoes. My son just started shaving and of course he loves the straight razor, even with a busy school schedule. To take the time and do something like that with a quality tool each morning is one of life's little joys. And it's certainly no more dangerous than driving to work. New comers - just take your time and I promise that after a month or so it gets so natural you'll love it too - from stropping to shaving to carefully cleaning and putting away - it's a Zen moment I actually look forward to each morning. Great stuff Adam - I'm in Australia and hope you ship here. I've always bought new, but am looking forward to checking out and trying one of your blades! Nitpickiness aside, this is awesome. Adam sounds like an awesome dude. It's nice to see these comments. Thanks everyone! To answer MG - very funny, I'm growing out my winter coat right now but will be going back to the clean shave when the weather warms up a bit! I agree with Deanna on two fronts: 1: straight razors are not ideal for shaving anything besides your face (unless you're a professionally trained barber), and 2: I love the idea of a post about shops that still offer traditional shaves. There are a ton in the area: Patsy's Barber Shop in downtown Albany and Jay Allen Barber Studio on Central Ave. just to name two. Maybe someone could visit a few, get shaves and write about their experience. Also, thanks Ethan, and Ryan, I'm proud to call Cohoes my home. And I remember making that custom steampunk-style razor, with the pre-1901, etched blade for Alessandro Gerbini. It's still one of my favorites! I wish I had a picture to post. Also, yes I lived in Feura Bush before, not Fairbush but I didn't notice that until now. Thanks! And thanks again, AOA for this profile!! !